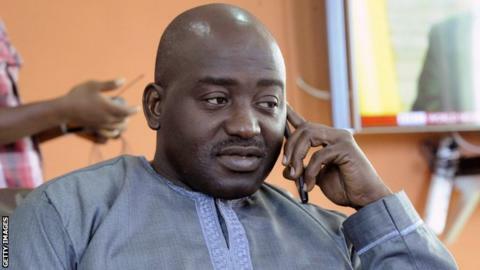 Musa Bility has appealed to the Court of Arbitration for Sport (Cas) after being excluded as a candidate for the Fifa presidental election. The Liberian FA chairman was ruled out by Fifa's Ad-hoc Electoral Committee after failing integrity checks. "I find this decision of Fifa to be unfair, troubling and disappointing," Bility said in a statement. "I have appealed to Cas urging that body to act with urgency in the disposition of this matter." The 48-year-old, who has questioned the veracity of the integrity checks, has also called on Fifa to share its findings on each presidential candidate with its 209 member associations, rather than keep them in-house. "Should only the inner chambers of Fifa and not the voting federations know about the integrity of individuals into whose hands the future of football is to be placed?" he asked. "I am open to integrity checks and welcome the process," he said. "The only thing I insist on is that it is done the right way and that the decisions made are objective, fair and transparent. "The ethics probe which resulted in my disqualification is based on information from "tabloid-like" sources that are not considered credible for such an investigation." Bility said there are two reasons why Fifa ruled him out of the 26 February elections to replace outgoing president Sepp Blatter. The first was a Liberian-related issue, while the second came as a result of a six-month suspension handed out to him by the Confederation of African Football (Caf) in 2013. "None of the alleged breaches in Liberia mentioned in the [Fifa] decision and the investigative report have ever led to a guilty verdict in the courts of Liberia," the statement read. "In fact, the investigative report uncharacteristically admits a dismissal by the courts." Bility's Caf ban was handed out after he used confidential documents from African football's governing body in a legal challenge against president Issa Hayatou. "I have repeatedly indicated that I will always stand up for what is right," said Bility. "At the time, I spoke against issues associated with the governance of Caf that I felt were not in the best interests of the development of African football. "Caf's Executive Committee suspended me for six months [but] the suspension was lifted halfway into the six months. "How fair is the conclusion reached by the Ad-Hoc Elections Committee that I should be banned for that wrongful sanction?" Bility, who says Cas has processed the appeal he filed on Monday and already informed Fifa, is the second election hopeful to lodge an appeal with sport's highest legal body against exclusion from the presidential race. Frenchman Michel Platini filed an "urgent" appeal on 20 November to have a 90-day Fifa ban, imposed amidst a corruption investigation, lifted. The president of European football's governing body Uefa has denied any wrongdoing.